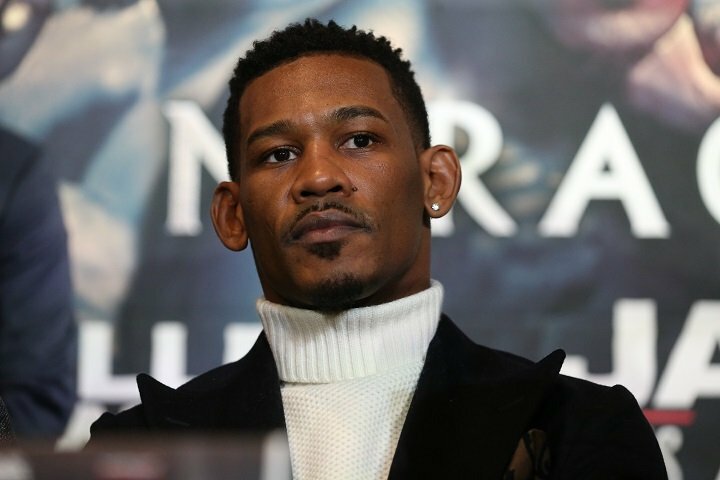 By Allan Fox: If the rumors are true, former middleweight champion Daniel Jacobs (34-2, 29 KOs) has been given an 80-20 offer from Golden Boy Promotions to fight Saul Canelo Alvarez on September 15 on HBO PPV in place of Gennady Golovkin, who has priced himself out for the fight. Jacobs’ promoter Eddie Hearn has already stated this week that the offer from Golden Boy isn’t what they’re looking for, and they want a better deal before they’ll agree. If the 20% offer is valid, then it looks like Hearn might want it increased to close to what Golovkin received for his fight against Canelo Alvarez last September. Golovkin received a 70-30 deal. I suspect that Hearn will ask for a 25% split. That puts Jacobs, 31, very close to where GGG was at. I can’t say that Jacobs deserves a 25 percent split, because that would put him right near the same level as Golovkin, and he of course isn’t as popular as him and he hasn’t accomplished as much in winning world titles. Golden Boy might need to dramatically overpay Jacobs to get him to agree to take the fight. Jacobs would a tool for Canelo to help rebuild his shattered image from his draw with Golovkin and his 2 positive tests for clenbuterol. Jacobs’ promoter Eddie Hearn obviously can sell weakness on Canelo’s part, which is why he’s already rejected the first offer from Golden Boy for him to take the fight. If the Canelo-Jacobs fight brings in 800,000 buys as Golden Boy Promotions CEO Oscar De La Hoya says it will, then a 20% split for Jacobs is very good money. That’s easily a career high payday for Jacobs if he can get a percentage of the pay-per-view upside. If it’s just a flat fee that Golden Boy is offering Daniel, which is possible, then that’s a different story. 20 percent is a very good deal for Jacobs. He and his promoter Hearn might be making a mistake in turning down that offer, because Jacobs is not going to be able to see that kind of money fighting other guys in the middleweight division. Not even Golovkin can bring Jacobs a payday that he’d get in taking a 20 percent offer from Canelo and Golden Boy. Jacobs getting a 10% purse split would be considered generous if the fight pulls in 800,000 PPV buys on HBO. If the Canelo vs. Jacobs fight is as huge as Hearn believes it will be, then it may even top 1 million buys. Canelo could get $50 million fighting Jacobs if he can get a 90-10 split and if the fight brings in over 1 million buys. It would also depend on how the fight is promoted. Jacobs, Eric Gomez, Eddie Hearn and De La Hoya would take up the brunt of the trash talking/promoting of the fight. Canelo Alvarez generally doesn’t do the heavy lifting in helping to build his fights by trash talking and giving a lot of interviews. He has De La Hoya and Gomez doing most of the hard work in selling his fights with their sound bites. Canelo and Jacobs has the potential of being a huge bout financially if it’s promoted in the right way. Jacobs will have to work hard day and night giving interviews for the fight to be as big as it can be. money. Golovkin made $20 million with a 30 percent cut against Canelo last September. If Jacobs can get a similar 70-30 deal, he could make close to what Golovkin did under the right circumstances. Jacobs got a 25% cut for his fight against Golovkin last year in March. The money that Jacobs could make fighting Canelo with a 30 percent cut would be far and above what he made in the Golovkin fight at 25 percent last year. If Jacobs takes the fight against Canelo, he could lose out on his World Boxing Association mandatory spot that he had to work hard to earn recently in defeating Maciej Sulecki by a 12 round unanimous decision last April. That was a very hard fight for Jacobs, and he’s fortunate to have knocked the Polish fighter down in the 12th round to seal the victory, because without that knockdown, he might have wound up losing the fight. Canelo is in a position now where he absolutely must face a very good opponent for his September 15 fight because of the flak he received from the boxing world from his 2 positive tests for clenbuterol and his controversial 12 round draw against Golovkin last September. The fans are not going to accept Canelo fighting Gary ‘Spike’ O’Sullivan or David Lemieux on September 15. Canelo has to redeem himself, and he best way for him to do that is to fight someone like Jacobs or the 28-year-old Jermall Charlo. Canelo needs to work overtime to rebuild his damaged credibility, and he can’t do that fighting O’Sullivan, that’s for sure. It’s got to be someone like Jacobs. Canelo giving Jacobs anything more than a 10% cut is really him choosing to overpay him, because he’s not a draw and he’s no longer a world champion. If you were to analyze Jacobs’ career, he looks to be on the downside since his loss to Golovkin. Canelo has options for his next fight. He can now go after GGG’s vacant IBF title if he’s willing to face Sergey Derevyanchenko. There’s also Jermall Charlo out there for Canelo. A fight against him would make a ton of money. Of course, it would also be very risky as well, because Charlo is at the top of his game right now and not heading downhill like Jacobs.